More Chinese people have been seen wearing Hanfu, the traditional costume of Han Chinese people, to take photos among the cherry blossoms on spring outings, which has boosted online and offline Hanfu sales, Beijing Daily reported on April 8. Hanfu is especially popular with students and white-collar workers, who enjoy the Hanfu's graceful and elegant quality. Hanfu enthusiasts usually rent or buy the costume online, while some pay photography studios to take photos of them in Hanfu. "I don't know much about Hanfu. I just think it's beautiful," said a girl wearing Hanfu while posing for photos, revealing that she bought the costume on China's major online shopping platform, Taobao. "I'm not sure about what hairstyle should go with the costume, so I found a photography studio that has Hanfu and ordered its flower season service," noted a female citizen surnamed He. Zijin, a Hanfu club in the Communication University of China, has more than 150 members and ranks among the largest clubs on campus. The club often holds activities such as Han-style music and dance performances, Han-style make-up and ornament classes, and organizes events relating to traditional festivals. 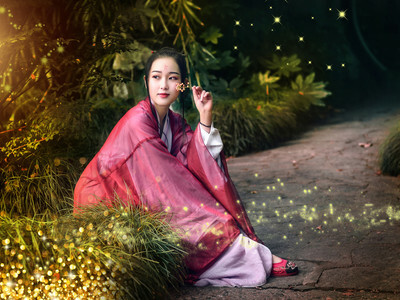 Membership is growing every year, according to Mi Fei (pseudonym), the president of the Hanfu club, disclosing that their activities attract dozens of people each time and are beneficial for popularizing Hanfu and traditional culture. "In the past, when Hanfu was not as popular, we chose the fabric ourselves and asked professional tailors to make the costumes for us. Since making Hanfu requires expertise, many shops can't handle the tailoring, which made it costly to own Hanfu," said Mi Fei, who explained that now there are many wallet-friendly Hanfu stores on Taobao, so most enthusiasts can easily buy their costumes online. Mi Fei explains that the increasing demand for Hanfu is down to the growing popularity of traditional culture within Chinese society. The popularity of Hanfu in the country has also generated great business for offline Hanfu stores. As Hanfu are usually expensive, many people choose to rent from a specialty store, which costs around 300 yuan (about 44.66 U.S. dollars) per day. Some customers are Hanfu enthusiasts, while some are tempted to rent Hanfu after seeing online posts, and some people have even visited Beijing just to rent a Hanfu costume, said Bai Qiu, owner of Su Sheng Ji, a Hanfu store in Dongcheng District of Beijing. "More and more people are now interested in Hanfu. They not only wear the costume to take photos in scenic spots, but also to performances and events, and even graduation ceremonies," added Bai, whose store is gaining popularity by the day.